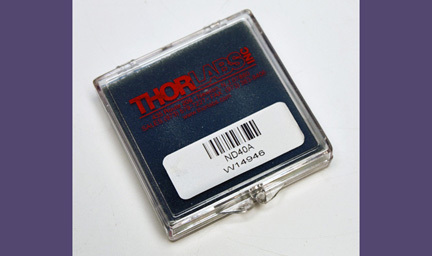 This ThorLabs ND40A Mounted Reflective Ø25 mm ND Filter has an Optical Density of 4.0 and is unused in its original factory packaging. Condition: Previously-owned, but unused in its original factory packaging. Buyer is responsible for determining the suitability of this product for their application. Shipping Weight: Approximately 2 lbs., including packaging. Please call LabCommerce at (408) 265-6482 for more information about our optics equipment.